Real-World Data Circulation is a new field of study that has been established by the Information Technology (IT) community. We often launch implemented products and services in society and acquire users’ impression or dissatisfaction about the products in the form of data. 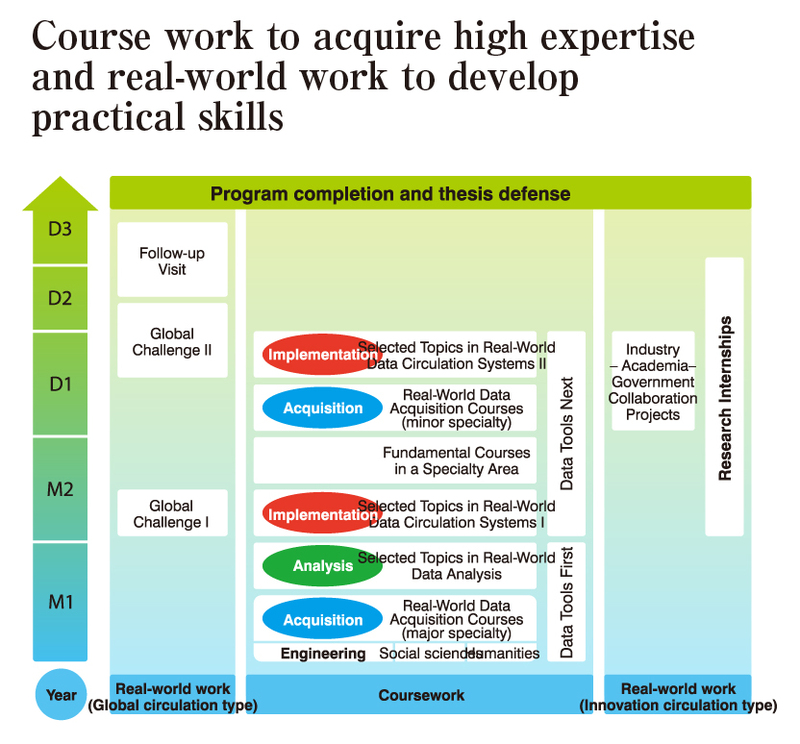 We believe that analyzing the collected data and then reflecting the results of analysis on new designs and fabrication is the origin of value creation, namely value creation by “Real-World Data Circulation.” In line with this, the goal of this program is precisely the training of human resources to support “Real-World Data Circulation” studies. Each student customizes his/her own study range and acquires a variety of knowledge provided by the program, mainly based on practical or industrial related science, rather than the conventional basic science. Consequently, the student will be able to foster his/her own ability towards development and value creation of a new field of application, and become a future leader in industry. The innovation of the production process by IT, which is referred to as “Industry 4.0” has recently advanced. It is doctoral degree holders with determination who will take up challenges for the next generation. Our program would like to send such individuals out to the real-world in order to create social value and contribute to the development of the society. The essence of social values that products and services bring is what people share as fundamental values such as "convenience, joy, health, and affluence." Such values are formed in exchange of “desires of users” and “thoughts of creators,” but the desires of users are constantly changing and are elusive. 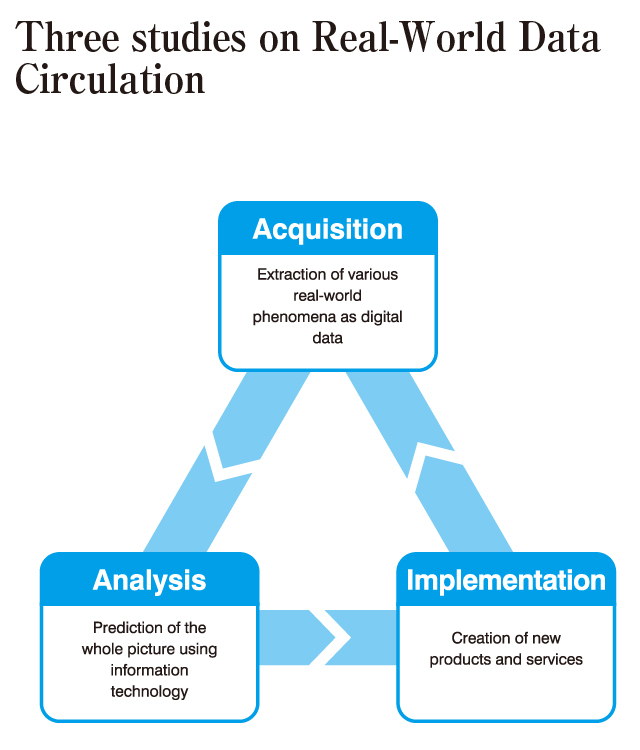 Real-World Data Circulation studies consider the desires of users and attempt to tie them to new products and services. In this program, students learn three study domains (acquisition, analysis and implementation) comprehensively. Students “acquire” the desires of users as digital data through the observation of various phenomena of the real-world, “analyze” the background of the data and the entire data by using information technology, and “implement” the results of analysis as innovative products and services. This program offers places called the Leaders’ Saloon and Leaders’ Studio where state-of-art facilities and information equipment are available, and where students can think freely and create ideas. The Leaders’ Saloon has discussion tables and digital poster panels installed, which can be operated with a touch panel by projection from a tablet terminal. It is utilized as a place for free interaction by students from different fields. 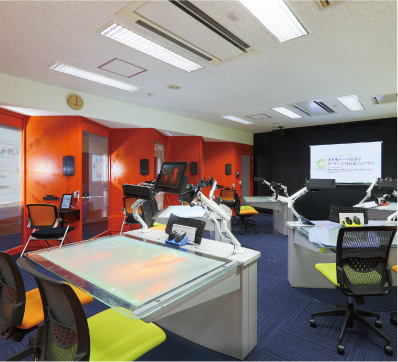 The Leaders’ Studio, equipped with a laser cutter and 3D printers, is an experiment studio in which students can mold ideas freely. We have created a good environment for manufacturing. Because indoor projector illumination and all window shades are programmable, a production space can be provided when data measurement, display, and presentation are performed. and work on business model planning in a group. Sometimes opinions vary, but it is a valuable experience in order to acquire leadership skills. Through group work, we grow the entrepreneurship spirit and foster the ability to play an active role in a company. Toyoda Central R&D Labs. ; DENSO; MHI Aerospace Systems; Astellas Pharma; NTT; IBM Japan; Netyear Group; Department of Industry and Labor, Aichi Prefecture; Microsoft Research Asia; Canon Information Technology (Beijing); Google Inc. Copyright © 2014-2016 Nagoya University. All Rights Reserved.